It’s tough when writing memoirs or writing from memory. Even the name memoir conjures up vain writers relaxing on their ‘chaise lounges.’ ‘What are you doing dear? It’s my memoirs. I could be a while.’ At the same time there are some people who have had fascinating lives. Not just famous people. Often we hear about the misery memoir which garners love and hatred on both sides. Is the reader rubber necking and somehow perversely enjoying the author’s literal account of how they were abused? Maybe the author is doing a public service, even a moral duty to tell their tale of woe, in a society that prefers not to speak. At least that way the crimes are exposed and readers are educated about some evils that lurk in our own backyards. Memoirs don’t always have to a precise account because if it were it would be boring. At the same times it’s quite difficult to conjure up a memory from the past. If I try to recall my first night at boarding school, I know it occurred. I know that there were twenty beds or so in that dormitory and that I was on a top bunk. I can’t remember the feelings or even what I was thinking, but only on reflection can I imagine that it must have been tough. To be away from your parents and family at the age of nine. Alone in that room with twenty others. I can’t remember the tears but I do remember the darkness. Or do I? This is where and what memoir writing is about. Piecing the past together like a detective, and in many ways it’s a good thing, because as a young child, are you really able to process what is going on? Has your mind developed enough to question and understand what it is you are experiencing? The world you exist in is not a world of choice. There is your family. That is your world. Father as God. Mother as Mary. And how they act enforces your view of how the world is out there. Am I lying there in my bed wriggling my toes as a nine year old or do I sit in a cafe as a forty eight year old man and conjure up the feeling of wriggling my toes? The door opened and Mr Blackmore walks in. A tall serious man. Our supervisor. ‘Lights out. And no talking. Or you’ll receive the slipper.’ He didn’t actually say that. I made it up but I do remember the night we were slippered for talking too loudly after lights out. We all lined up ready for our punishment. As the first boy went forward he lifted up his dressing gown. No doubt to ensure the nine inch plimsoll would do as much damage as possible. I heard the whack of the sole. And then the boy screamed out loud, then ran forward, and did a forward roll with a star-jump afterwards. Everybody laughed as we walked down the line to receive the slipper. Welcome to boarding school. This was the late seventies heading into the early eighties. 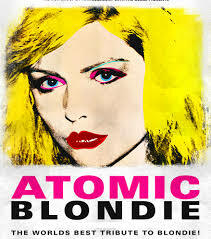 I had just brought ‘Atomic’ by Blondie. She was my muse. Corporal punishment was still accepted. Margaret Thatcher was hated. Read My First Novella!